I hope everyone has a wonderful and blessed weekend! 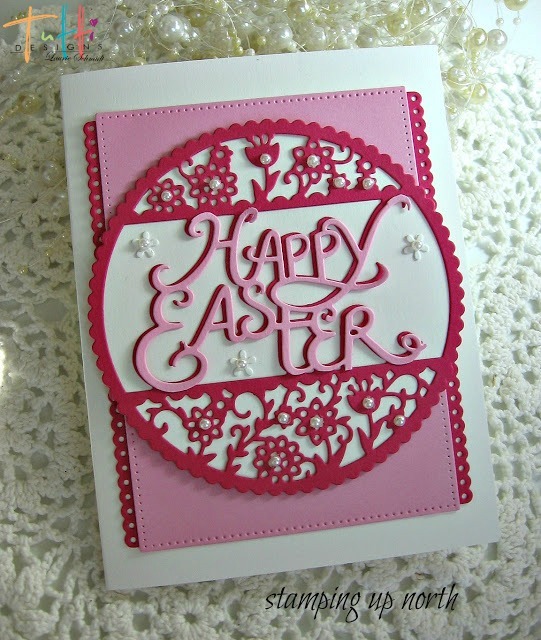 Today I'm sharing an Easter card I made with Tutti Designs Happy Easter die. It's such a beautiful die...I love the tiny flowers! I cut it out twice in two shades of pink, and then fussy cut the words out and adhered them on top of the others. Then I traced the die onto some white paper, and adhered it onto that. I added some tiny pearls on the centers of all the flowers. The tiny flowers I have scattered inside the circle are from the Birdhouse Garden die. Can you see the centers of the flowers below? They had popped out and were laying on my desk from another project, so I decided to add them to this card. Then I cut out two of the Butterfly Strip and cut off just the fancy edges. I adhered those onto the back of a dotted nesting rectangle. Then I adhered the Happy Easter Circle onto that. This is just beautiful Laurie! Love your colors and I really like how you did the sentiment panel! Looks AWESOME! Thanks for wonderful inspiration! Happy Easter! Very creative use of these dies, Laurie! Once again you've given me another idea for the Butterfly Strip. Took me a minute to see where you'd used it. Love this! Really a cute "Happy Easter" die! 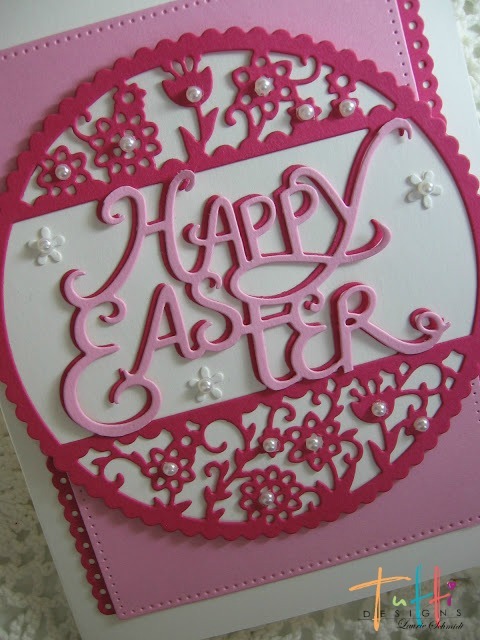 Really sweet Easter card and I love the colours. Beautiful! Wow great use of the die cuts, Laurie! So pretty, great use of that die and the colors are wonderful!